Four Will Challenge Hazardous River, they wrote "Four adventurous young Tasmanians will set out today to explore Tasmania’s ‘river of no return’, the hazardous Franklin River." 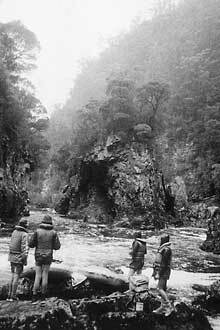 Dean, Hawkins, Trevor Newland and Henry Crocker took to the water, only to confront a problem in the same gorge that had defeated the team before. One canoe was trapped and finally broke in halves. So Crocker’s canoe would have to carry three people and most of the gear, while Dean would sit aboard the half of his canoe saved, acting as a sort of raft. They climbed to a hut and spent three days remaking the canoe: “The end product was quite a trim craft — two feet shorter than the original — which would have to carry two men and some of their gear. This was a tall order but we had no choice. It was either continue with one and a half canoes, or abandon the attempt. By JOHNSON DEAN | Life in the late 1930s and early 1940s was tough. With wartime privations and lack of electronic amusements, kids had to find their own fun. For Johnson Dean, growing up in Evandale, it began with the nearby Esk River for swimming and canoeing, and he found like-minded friends with whom to share his first adventures. They went on to try their heavy homemade canoes on other, wild rivers. In his book, Shooting the Franklin, Early Canoeing on Tasmania’s Wild Rivers, published in 2002, Johnson Dean vividly recalls those adventures. Bob Brown, who wrote the forward, calls them “exciting, charming and, at times, harrowing”. They start with Huck Finn-style trials on the South Esk river in the mid-1940s. In heavy old canoes built along Canadian lines — a framework of steamed hardwood laths, covered with aged hessian and painted with tar — and depending on a few tins of food scrounged from the family’s postwar ration plus the rabbits and fish they could shoot or catch along the way, Dean and companions, including Dean’s dog Flea, made their first voyage on the South Esk. But it was also idyllic. Flowing south, between the Eldon Range to the east and the Tyndalls to the west, the Eldon River is joined by the South Eldon to form the King. 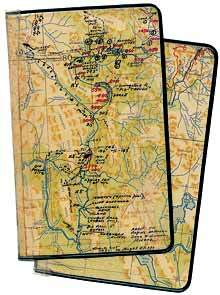 Left: Map-covered notebooks used to record the gang's adventures. Click here to see larger version. The adventurers were Johnson Dean, John Hawkins, Jeff Weston and Joe Scarlett. “Sometimes,” writes Dean, “things did not according to plan. However, we soon realised that getting to and from the river was the easy part. Once on the river we would have to cover 60miles (100 km) and, more significantly, descend 1000 feet (300m). On the afternoon of December 28, 1951, we launched our folboats: Weston, Joe Scarlett, Hawkins and I. The river was high and fast. Hawkins and I capsized in the first rapid and lost a paddle and a boot. After this we tied everything in. We managed to get caught in a ‘stopper’, a concentrated flow of water falling over a drop into comparatively still water which creates a surface backflow, drawing you back under the falling water. To help prevent this happening you build up enough speed to keep moving after plunging over the fall. The worst situation is to go over sideways. Then you have no momentum to carry you away and the effect of the reverse flow is exacerbated. The best you can hope to do is push yourself away with your paddle. If this fails the canoe rapidly fills, becomes unstable and capsises. The danger then is that it will keep rolling and to avoid drowning you must escape as quickly as possible and, once free, drop well below the surface to use the reverse flow to cary you downstream. Nevertheless, “we revelled in shooting some excellent rapids”. 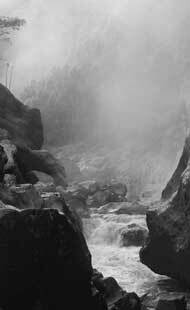 Until it rained and the larger rapids were more formidable than ever. Between these, whirlpools threatened disaster. However it was a large flat rock that proved their undoing. The canoe nosedived and jammed and they were swept away from it.